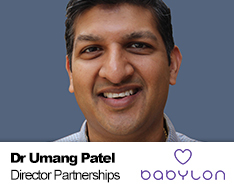 Umang is Partnerships & Clinical Director at babylon. At babylon, Umang spends his time trying making sure that safe, effective and personalised healthcare is available to everyone, everywhere. Being responsible for all insurance and pharmaceutical relationships at babylon. that understood and actively engaged in health management. So, to help be someone to bridge the gap between clinicians and managers he joined the NHS Leadership Academy as a Clinical Fellow in 2012. This set him on a path which included being Head of Clinical Transformation at Aviva UK where he was responsible for a series of new initiatives in the model of healthcare delivery. Umang also serves as a trustee of Attend, the UK’s national charity for volunteers.